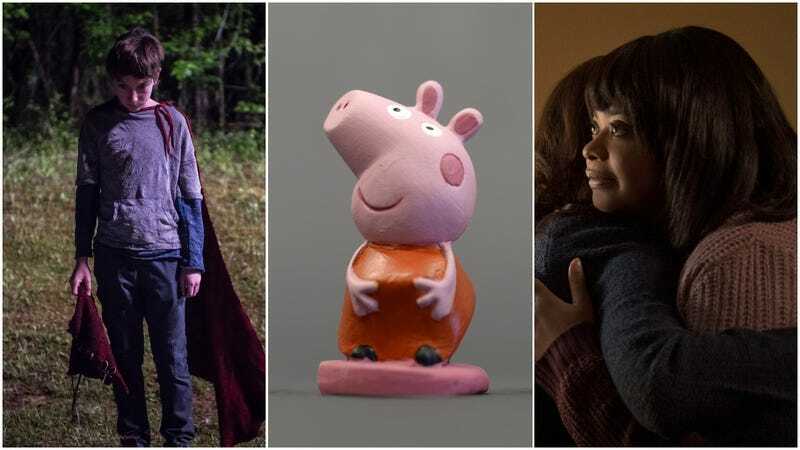 Proving that you can really never traumatize kids too early these days, the BBC reports that the operators of a theater in the U.K. recently accidentally played trailers for two violent, psychologically upsetting horror films—Octavia Spencer’s Ma, and the uber-violent Superman riff Brightburn—in front of an audience waiting to watch a Peppa Pig film festival. And while we can only imagine that there was a tiny second there where the parents in the audience thrilled a bit at knowing that their various spawn finally knew what it felt like to be forcibly subjected to subject matter so far outside their preferences and tastes that it would likely induce nightmares—i.e., the full Peppa Pig experience—that secret dose of schadenfreude swiftly gave way to anger at the mistake. If you haven’t watched either trailer, these are the movies where Spencer plays a psychopathic shut-in stalking, drugging, and generally tormenting some kids who make the mistake of partying in her basement, and the one where evil little kid Superman literally rips a whole bunch of hapless cops apart with his bare hands. And while some of that content might actually be kind of comparable to some of the algorithmically generated weirdness that pops out of YouTube videos featuring Peppa these days, it was still enough to enrage the parents in the audience. Here’s BBC journalist Charlie Jones, detailing her two-year-old’s very first trip to the theater, ever: “I tried to cover her eyes during the trailers and told her they were silly films for mummies and daddies, but there were lots of kids crying and she was very confused and started crying too.” Oof! Empire Cinemas has apologized for the mistake, but has yet to make the truly responsible step and offer to pay for these kids’ therapy bills/art school educations for the foreseeable future.